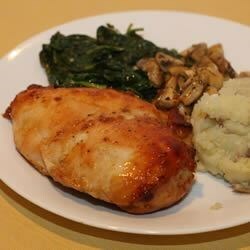 "This is an easy to prepare, delicious boneless chicken breast bake." This was delicious. I used lemon pepper, Emeril's Essense and garlic salt. We dripped the broth over rice. I will definitely make this again. Used chicken halves and baked at 375 for 1 hour. Wonderful flavor and crispy skin. Have made it twice to rave reviews!